A wise book about being mindful and living life to its fullest, this is a book that I've read before and will read again, containing as it does so much sage guidance. It is long, perhaps being therefore intimidating to first-time readers, particularly if one reads it as one is inclined to read most books, consuming it in large gulps over several days. Instead, this should be read in tiny bites, perhaps two pages a day, slowly and carefully chewed, swallowed, and digested, maybe even reading without too much attempt being made to "understand" it rather than simply letting it sink in gradually so that it becomes a part of one's own intuitive wisdom. The basic message, and I do Kabat-Zinn an injustice to try to reduce it to a sound bite, is about paying attention, each moment, right here and right now, a radically different way to live for most of us and something with which I struggle even as I know how wise and wonderful such an approach to life can be and is. That is not the same as asserting that circumstances change as a result of being mindful, for in a real sense there is no "goal," no place to get to. Rather it is more about truly seeing and knowing what is going on moment by moment so that one can respond wisely and well. This is an in depth book about the history, development and experience and effect of meditation. It isn't about religion although the development of meditation is an integral part of the religious tradition in East and therefore always present. Kabat-Zinn covered the physical/medical benefits of meditation on stress in his earlier book, Full Catastrophe Living. This was the text for a course I took on the practice of meditation for stress management some years ago. My personal experience meshes well with the description in that volume. Since then, I've discovered that meditation is impressively well-established as a tool for patient care. However, mindfulness-based meditation leads to other changes in the practitioner. The most obvious is the ability to maintain a thoughtful and calm approach towards crisis. For myself, I would say this is a more mature development as a result of the practice. As the practice de-stresses you physically, you learn to regard the daily minutia of your life, not as sources of worry, pain or calamity but as challenges that can be met after due consideration. This volume - "Coming to our Senses" is for those of us who have just reached this point in our practice. The chapters in the book are actually essays (some short, some by no means short) on different aspects of the meditative experience - useful as guides for those who practice. But the philosophy that drove the development of mediation in Eastern religions is also present. Mindfulness-based stress management is based on an integrated approach towards your life; balancing your physical and mental needs with the expectations of the outside world. Coming to our Senses espouses the view that the "full catastrophe lifestyle" philosophy is driving our world, leading to short-sighted approaches in the way we care for our families, our community, our world. Kabat-Zinn writes extensively on a more integrated approach using the philosophical principles drawn from the Eastern religions and exposits a new approach in politics, medicine, our institutions and communities. Given short-sightedness is my major complaint about politicians, I cannot disagree. Kabat-Zinn's writing is eloquent but not necessarily easy to assimilate. The book is very long and will take several readings for full comprehension. I often wondered as I approached the end of a chapter what his point was. Sometimes the chapter was so long, I wondered what the beginning of the chapter was :-) Clearly, a good careful editor could have improved the book. But to be fair, after reviewing the high quality of the writing, it would have been difficult to find an editor who could have advised Kabat-Zinn on just how to shorten the development without touching his prose. This book describes mindfulness - a practice for paying careful attention to the present moment and using meditation to focus that attention - and its potential benefits, from nearly every angle. I'd recommend it highly for those already interested, and at least somewhat versed, in mindfulness. For those with little interest or experience, large sections of the book might come across as lofty, verbose and too conceptual to help ground their mindfulness practice. That might just be my personal experience speaking (well, what else do I have? ); I picked up mindfulness practice from another book that put everything into very relatable steps, and I read this book to deepen my understanding. "Coming to Our Senses" is a very thorough exploration of what mindfulness means - and what human sentience means. At its best, the book presents intriguing evidence of mindfulness benefits, such as scientific research documenting health improvements that seem to stem from practicing mindfulness. The book also describes vividly the unique pleasures of practicing mindfulness, down to things as simple as feeling the air move over one's skin. At its lamest, the book makes vague and sweeping claims about how mindfulness could benefit things like national governance, sometimes presenting little supporting evidence or clarity on what claims it's making. If I had to say one thing about author Jon Kabat-Zinn, I would call his mind impressively expansive, both in the directions of reductionism and holism. He can relate mindfulness to anything, from personal life and poetry to molecular processes, physics and the origins of the universe. The book has a second level, I think: Beyond what Kabat-Zinn writes, he himself is a great example of how to be mindful: allowing one's awareness to roam and find what it will (with varying degrees of control, and with the open-hearted engagement needed to really follow what it's doing), and allow whatever the mind finds to present itself, judging it as little as possible so even "negative" things can be instructive.My main criticism is that Kabat-Zinn could distill his lengthy explorations (and run-on sentences) into something a little sharper - the book is over 600 pages and is often repetitive. The author has, however, written short books and more basic ones - so his constructively wandering mind has gone there too. Compared with "Full Catastrophe Living" (by the same author), this one wasn't as seminal for me; however, the very brief, almost stream-of-consciousness chapters in this one allow the author to touch on a lot of topics linked with mindfulness, and helped reinforce the need for us to connect to what we are going through now, moment by moment and breath by breath, rather than fixating on the past or the future all the time or dwelling in a "virtual" reality. Some chapters were particularly great; others just so-so, but all in all it was a great mix of wisdom with occasional poetry thrown in, zen quotes and more. Sometimes it seemed too "granola" to me, but overall a worthwhile book. To really absorb the thoughts here, it takes a long to read the book (hard to skim). I really admire this author though. Kabat-Zinn has brought East and West together in his remarkable career. He shares his work from the University of Massachusetts Medical Centre which has established the ability of mindfulness training to reduce pain and improve wellbeing in many different medical conditions. He explains how simple mindfulness exercises can for example speed up the healing of psoriatic plaques. He describes the process by which CBT psychotherapists come to him for direction on incorporating mindfulness into CBT for depression, a process which has recently shown impressive results. Kabat-Zinn's writing is captivating and mesmerizing and this book takes longer to get through because the point, of course, is to try these techniques yourself. I have to say I am intrigued... The book kind of drags on towards the end, but I remain a fan. This was a long yet important and useful read. At 609 pages (not including references, suggested reading, and index! ), it felt like I was reading some sort of Bible-equivalent for mindfulness. At this point in my mindfulness journey, it was perfect. I wouldn't really recommend it to a newbie just for the potential of burnout. I think his "Wherever You Go, There You Are" is a much better intro.The last 100 pages or so dealt with politics and how much our world leaders could use mindfulness and solve a lot of big problems. This was published in 2005 but especially after our recent election this seemed quite relevant. However, it did take me out of it a bit. It almost felt like a second mini-book to the rest of the book.I was struck at the beginning of how long his sentences are and how much he loves commas. It was downright distracting at first and near the end. Editors, wtf? I adore JKZ. I needed this book! I was lucky to attend a workshop on "mindfulness and education" in which JKZ was one of the instructors, and this book was recommended reading, which is why I got it. I highly recommend it for its introduction to the importance of mindfulness, and for JKZ's views on things. I will try to elaborate later, as I found this book so meaningful to me that I am finding it hard to summarize.Oh, and the book is good for the poetry alone -- he often puts a poem in between chapters, and some of them really struck me, both relevant and beautiful.There was so much depth in this book, for me, that I hope/plan to re-read the entire thing again. How can you not appreciate Jon Kabat-Zinn? He opened the stress-reduction clinic in 1979 based on mindfulness practice. I read Full Catastrophe Living years ago, and this book is a great companion and expansion of what Kabat-Zinn has learned in the interim years. I'd like to require this in a poetry writing class, not just because JKZ knows and quote poetry, but because poetry is about coming to your senses. Pay attention. To yourself. To the soundscape, the touchscape, the sightscape, tastescape, smellscape, and mindscape. In my humble, opinion, many of the chapters are as powerful and thought provoking as any Kabat-Zinn I have read. Many chapters are more theoretical ruminations or metaphors. This is definitely not the book to begin learning the basics of mindfulness. BUT, do go back and mine for the nuggets when you understand more than the basics. If you want to learn all about meditation in one book, this is for you. Short chapters and definitely written for people new to meditation. Given that I am not new to meditation ... and it's a VERY thick book ... and a bit repetitive ... I didn't finish it. What can I say ... so many other books, so little time. Not my favorite by one of my favorite authors. So many good messages, but too long to get the messages across to all but the devoted. Enthält neben viel sinnvoller Einleitung, über die andere schon in deutlicheren Worten weniger Papier verbraucht haben, leider auch unfassbar viel Geschwafel. Viel von dem Geschwafel klingt nicht mehr ganz so abstrus, wenn man sich mehr mit der Materie beschäftigt hat. Trotzdem würde ich behaupten, dass jeder kritische Mensch einige Überwindung aufbringen muss, um dieses Buch von der ersten bis zur letzten Seite fertigzulesen. Not my favorite JKZ book, but definitely in the same vein as his other works on mindfulness practice. And I love the title. To me this book is like the Tao te Ching but 500 pages longer. What can I tell you? If you're dense like me sometimes you need the longer explanation. Heehee! If you want to know about mindfulness and meditation, this is the book to read. A true inspiration. I didn't really finish this book. Lots of skimming and page turning. Too dense. Nothing like Wherever You Go There You Are. I wonder who the intended audience was? I like to think of this as the mindfulness manual: it's an absolute essential to read for anyone interested in waking up. Near the end I did skip a few chapters that didn't interest me, but in general, this book was a hefty but worthy read. La obra esencial sobre mindfulness. Donde está desarrollada la raíz de todo lo que aparece en sus posteriores y más amables libros. Imprescindible para practicantes de esta disciplinas y otras adyacentes. I gave this one the old college try, but it's just not working for me. I actually think it's a fine book, with some really insightful gems, like the excellent and succinct description of Buddhism in the "Dharma" chapter and this passage about individual experience:"Since awareness at first blush seems to be a subjective experience, it is hard for us not to think that we are the subject, the thinker, the feeler, the seer, the doer and as such, the very center of the universe, the very center of the field of our awareness. Perceiving thus, we take everything in the universe, or at least our universe, quite personally." (169)That passage in particular has caused a small but significant shift in how I look at the world. The trouble is that Kabat-Zinn uses an awful lot of words. There's a lot to read between the gems, and I find myself getting...bored. Perhaps part of this is because I've already read Full Catastrophe Living, and I've not found much that's particularly new in Coming to Our Senses. Or it could just be that I'm not in a nonfiction mood or that I really just want to "do" mindfulness rather than read about it right now. Whatever it is, I'm going to read the section on healing the body politic, and maybe jump here and there, but when I go to library day after tomorrow, I'm going to be taking this one back, no matter how much I've left unread. According to my Goodreads page, I began reading this over a year ago. It is the type of book you read a little at a time, and maybe apply some of what your reading. I have the utmost respect for Jon Kabat-Zinn; I’ve referenced him about a million times, he’s pretty much the foremost American authority on Mindfulness. I fell in love with the first book of his I read, “Wherever You Go, There You Are”. That’ll always be one of my top recommended books for mindfulness and meditation. With this book, I felt like Kabat-Zinn wanted to cover everything needed to change the world. One of my clients, in reading a different book of Kabat-Zinn’s, (Full Catastrophe Living) and felt it was too long. I felt similarly about this book, though I get it; he’s trying to lay down a plan for each individual to change him or herself, and the world. It’s over 600 pages, though most chapters are short. Still, it can be a little overwhelming, and there were times I just wanted to be done with it. Kabat-Zinn can be a bit verbose, though his writing can be poetic at times. I also enjoyed the quotes from other writers that he builds upon. But at times, I felt, “okay, I get the point”. Yet the analogies kept going. I don’t wish to be overly harsh, as I said, I have the utmost respect for his expertise. And, to be fair, this volume is full of knowledge, expertise, and suggestions to help one become more mindful. I just wish it had been more to the point. Another huge book, with life changing ideas. This is a book to be read slowly, and to mark pages to come back to, and indeed, I think it is the kind of book that needs to be read, more than once, to be dog eared an battered because that is probably the only way to get the full value of this book and what it has to say. It has many things that will make you think, ponder, and rethink, but also some down to earth practical advice on how to bring mindfullness into your own life, to make it work, and to make your life, and possibly all life on this planet, better. It talks of interconnectiveness and inner landscapes and of the work and practice it takes to fully understand, use and benefit from this sort of shifting mind set. The mind itself is explored and science behind it as well. I can't recommend this enough; but be warned; it could change your life, or at the very least how you think and what you are willing to try. I really can't do justice to all this book contains, and can do when you read it, and for that I am sorry because it is another book everyone could benefit and learn from. This is a very worthwhile read - even at 600+ pages. I read it immediately after a more "academic" treatise about the melding of CBT and mindfulness, which I enjoyed. Perhaps because of the juxtaposition of the two reads, I enjoyed the personal anecdotes and occasional humor in "Coming To Our Senses".On the downside, although JKZ claims not to be a Buddhist, he certainly spouts quite a lot of Zen and other eastern mysticism.I was also particularly struck by his repeated use of the term "heart" for the root of emotion and love, as if that particular organ were not merely a blood pump. Our love/compassion/soul if we have such, must exist in the brain - perhaps JKZ was referring to the "heart in the brain", if that makes any sense - but his failure to clarify this put me off somewhat. I fear this says more about me than about the author :)I did really enjoy this tome and found it inspirational, in spite of the above. Also, the short, bite sized chapters make it a less onerous read than it might otherwise have been. 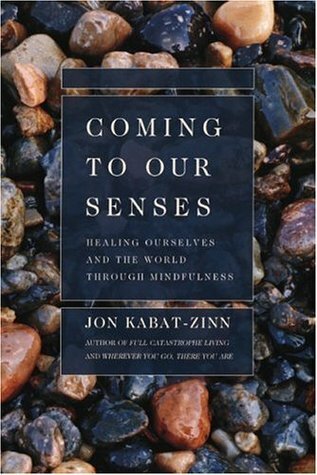 Jon Kabat-Zinn implores the reader to take a step back from their everyday life and notice the world around them, in his book, "Coming to Our Senses." The text is an intimidating 609 pages, however, the author breaks the book into eight independent sections guided by their specific didactic intents. Teaching lessons about meditation, mindfulness, and present moment awareness; Kabat-Zinn has provided us a textbook for improving our everyday experience of life naturally and immediately. What I really enjoyed about this book, as a reader and a writer, is how the author included specific anecdotes and stories that related perfectly with the main topic of its section. If the reader does not have enough time to finish an entire section, they can conveniently read a single anecdote, most of which are only a few pages long and full of meaningful information. This book has certainly been beneficial to me and my life. Well, I discovered how difficult it was to read this book mindfully when my mind was racing ahead to September and school starting up! I also had to return this to the library, so felt a bit pressured about getting it read by a certain date. This book is all about mindfulness! With over 600 pages, I found this book to be somewhat daunting. It is thoughtfully and beautifully written, but somewhat redundant at times. I found myself skipping over chunks that didn't particularly interest me (my impatient, distracted mind luring me elsewhere! ), while other parts held me spellbound and I found myself nodding my head and recognizing many important truths about myself. Jon Kabat-Zinn's writing is warm, gentle and compassionate. There is also some beautiful poetry sprinkled throughout the book. If I had to do it over, I might take my time and try to read one chapter a day. It's a book worth reading slowly and thoughtfully! Too much for me. Drawn out. Tedious. A bit arid. This book and I were not meant to get together. I have read several other books on this subject (which is really the heart of where I am in life right now!) by a variety of writers and found them engaging and challenging. This one is far too long! After a while, even skimming started to feel pointless. I have lost all motivation to complete the book.Perhaps I will return to this tome in a few years, after my practice is well established, and I will think to myself, "Wow! This book is amazing! I wonder why I couldn't get through it that first time?" For now, however, I'm going to read the other mindfulness book I picked up and return to Kabat-Zinn's "Wherever You Go, There You Are" for another shot at this author. This was my second reading of this book and I find that, as usual, have enjoyed and learned more at my second reading. This book is not for the one uninitiated in either Buddhist or yoga practices and one not interested in the philosophical aspects thereof. The sheer size of the book, more than 600 pages can be a problem. But for those without such constraints it is a very informative volume that delves into the multi-dimensional aspects is interesting. Whether Kabat-Zinn is discussing meditation, the attentional ailments, the sensory world, the complexities within reality, or the various possibilities for healing the mind or the body politic, the in-depth look into issues is impressive. The language is poetic at times and the length of the chapters is comfortably short. An all time favorite. Don't really do the meditation but I reread it on a regular basis. The chapter called "Nowscape" is quite profound. "Now is the future of the previous moment just past, and the future of all those moments that were before that one. Remember back in your own life for a moment, to when you were a child, or an adolescent, or a young adult, or to any other period already gone. This is that future. The you you were hoping to become, it is you. Right here. Right now. You are it. Don't like it? Who doesn't like it? Who is even thinking that? And who wants "you" to be better, to have turned out some other way? Is that you you too? Wake up! This is it. You have already turned out." This book contained many inspirational ideas for enhancing one's awareness, but boy, it could have used a good editor. About 2/3 of the way through I got bogged down and had trouble ever getting un-bogged. Sentences that run a paragraph long aren't always a bad thing, but too often in this book they were. One of my favorite stories tells the answer a wise Buddhist monk gave a student to the question "How do I become a Buddha?" The monk replied, "Attention." The student said, "Is that all?" and the monk responded, "Attention! Attention! Attention!" That final response is really all Kabat-Zinn is saying in this book. Doesn't seem like it should have taken 609 pages. I'd have given this book more stars but it simply goes on too long, repeating and reiterating its primary message to the point where it almost works against it. The book seems like a collection of essays, individually fascinating, but collectively overwhelming. Kabat-Zinn is a good writer, and his message of being mindful, living in the present, and opening our awareness to what is real is very potent. It's not original, of course, but in this day and age it's one we cannot hear too much. This book did re-inspire me to get back into a daily meditative practice, and for that it was worth the read.